I made this string earlier this year when we first started the challenge and it has been waiting to have the borders sewn on. I finally got to it and made a strip pieced border from the leftover strings. I will be machinequilting this one soon I hope. I like the light and dark green string blocks with white centers. 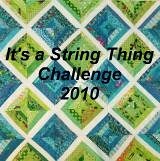 Beuatiful green string quilt. I am busy refolding my green stash bin and now I am also thinking of a green string quilt. I like the borders. It really finishes the quilt!